It’s not the event itself that makes you nostalgic, it’s the memory of the event. Certainly my experience of the event may not have been as profound as many Americans. Yet, so much of it was the same. A meal with the family. An opportunity to be thankful for what we had. Time spent with family (whether we liked it or not!). And whatever the historical reason why we celebrated, we simply wanted to enjoy a good meal together and to be thankful. And, while I may not always have been thankful at the time, I’m thankful for the experience and the memories to this day. While so much is the same, so much is different. In a few short days we’ll celebrate Thanksgiving here in the United States. There will be turkey, pie, and all the trimmings. There will be traditions and family, and good times had by all. And while the proclamation of giving thanks for survival in a new land in 1621 might be more profound than giving thanks for the recovery of King Edward VII in 1872 (although Thanksgiving was celebrated informally in Canada as early as the 1578 voyage of Frobisher), at the foundation, they are the same: being thankful for what we have, no matter what we have. I haven’t been able to celebrate Canadian Thanksgiving since moving to the US (it’s hard to make the trip back to Canada for the weekend), but I am thankful for the many years of Thanksgiving celebration that I did have. And I’m thankful that, even while I celebrate the event on a different day, I’m thankful for my homeland, my family, and Thanksgivings of bygone days. And that’s what being thankful really means. It’s not about being thankful when in plenty. It’s about being thankful in all situations (1 Thessalonians 5:18). There are times in our life where we don’t have all the family support or even the big turkey on our table. That doesn’t mean it isn’t time to be thankful. Have a roof over your head, but stovetop stuffing on your table? Be thankful. Don’t have a roof over your head, but have friends and family that help to take care of you, be thankful. Don’t have friends or family to take care of you? Be thankful you are alive and have breath. Everyone has something for which they can be thankful. The question to ask yourself this year is, in plenty or in want, what can I be thankful for? I missed Thanksgiving in Canada for another year. But I celebrate my Canadian holidays in abstentia (my wife is gracious to me that way). I don’t have to be present to celebrate Victoria Day, Canada Day, or Canadian Thanksgiving. I can be thankful that I can celebrate here, both Canadian and American Thanksgiving. I can be thankful for family, for food, for fellowship, for friends, for everything I have. And I can be thankful for, the things I once had, and the things I will have. I’m thankful for the memories of things past, and the memories I make today. What are you thankful for today? Preaching, as most should know, is not just providing a lecture (despite the many preachers that do this week in and week out) but involves taking the text preached and applying it to the lives of the hearers: essentially, persuading them to live differently in light of the sermon. While this should see a no-brainer, considering the failure of many to do this, Persuasive Preaching, by R. Larry Overstreet, is a helpful, academic tome for pastors seeking to be better at persuading people to change. The bulk of Overstreet’s book focuses on the biblical support for persuasion. Some, perhaps concerned about manipulating people, may never actually call people to live or think differently. Therefore, it’s important for Overstreet to develop the overwhelming support for persuading people in our sermons. It is clear from his presentation, that the Bible calls those who “preach” the Word of God to people, need to call them to live or think differently in light of the Scripture preached. It is insufficient to simply teach them, you must call them to live differently. He then shows how those more persuasive messages might look, which is probably the strongest part of the book. Here Overstreet is helpful at laying down messages that motivate, solve problems, demonstrate cause and effect, and refutation. This is helpful for pastors to see the varied ways they may approach their preaching to help bring people to real biblical change. Finally, Overstreet deals with issues of the problem of manipulation, how the Holy Spirit relates to preaching, and the invitation. And it is over the invitation this writer disagrees a bit. Overstreet doesn’t deal at all with the problems of the invitation system (see Iain Murray’s excellent work on the invitation system), but I think Overstreet is not wrong to suggest people make a definitive move to change following a message, but the “coming forward” of most invitations becomes tools to manipulate rather than make actual biblical change. Other than Overstreets failure to deal with those with whom would disagree with him, the application of his book in these chapters is helpful. The appendices are rather technical, but the sample sermons is helpful to see what this would look like in real life. Overall, Overstreet’s book is helpful in converting people to the idea that preaching is more than lecturing. It should be calling people to biblical change. While my caveat over invitations stands, Overstreet is a helpful addition to the preacher’s library who wants to improve, overall, how the Holy Spirit uses their preaching to bring about change in their hearers. Expository preaching (preaching that takes as its main point the main point of the Scripture that is being preached upon) is defended in the Bible itself, and there are both benefits from it for the pastor and for the church. Things that are a good thing sometimes takes a lot of effort. It is in expository preaching that we really flex our pastoral muscles. Often it seems that many in our churches expect that we can feed them from the Word of God without actually preparing for it. This is both a crime for the preacher and for the congregation. The fact that we’re almost at Thanksgiving made me think about this illustration. I have a friend, Heinz Dschankilic, who is a wonderful servant of Christ and Executive Director of Sola Scriptura Ministries International, who offers an excellent analogy about sermon preparation. He explains that there is quite the difference between a microwave dinner and Thanksgiving dinner. The microwave dinner is quick but rarely tasty and frankly, far from filling. Thanksgiving dinner though is delicious and highly filling, but it takes substantial time. For a shepherd to effectively feed his flock, he needs to take time to prepare the feast for the flock. Isn’t a feast better than a Hungryman TV dinner? It is important as shepherds to feed our flocks. If I want you to to be healthy and to live according to the glory of God, I need to feed you what they need, a steady diet of the Word of God. And before I can feed you, I need to prepare the feast. This takes time and effort on behalf of the preacher, but the rewards for both the pastor and the flock are extraordinary. It doesn’t mean I’m only stuck in my study. I’m out and about visiting people, evangelizing, and other pastoral elements. But it’s helpful to know that the time spent in my study, hopefully helps to make me a more effective preacher. So, for all you at Cornerstone BFC, know that I want the best for you and I intend to prepare feasts for you each week from the Word of God. This means that it will take me time each week to prepare the meal for Sunday. It means I need dedicated time to study the Scriptures, to apply them to my own life, so I can proclaim them to you. But in the end, this dedicated time of study will pay off as you are able to experience a steady diet of the Word of God. I intend to feed you and feed you well. So, I must prepare the meal well! There has been a marked growth in good children’s material from a gospel-centered focus of late. For too long, most children’s material was focused on a moralistic picture of our relationship to God, rather than a Christ-focused one. I am thoroughly pleased that this change is happening and that I can find good books for my children in that vein. Alby’s Amazing Book, helpfully fits into that category. The story of a squirrel who likes adventures is very cute. The fact that his adventures are tied into real life stories from the Bible is even better. The fact that the Author of those stories is real and loves Alby, is the best part. It’s a short book, so don’t expect a lot of theology behind it. For instance, I was wishing for Alby to tell us more about the One at the heart of the stories he loves, but perhaps that’s best left to other books, and Alby’s Amazing Book serves as a little appetizer (especially consider Jim Hamilton’s recent, The Bible’s Big Story). Overall, it’s helpful to point out to our children that the stories in our Bible are true, and aren’t there in isolation from the rest, but there to point us to the Author of the stories. In that, Alby’s Amazing Book, succeeds. As to the illustrations, they are certainly eye-catching and interesting, if albeit a bit frantic at points. My second youngest found it a little difficult following the illustrations at points, and is convinced Alby is a bear and not a squirrel, because he doesn’t really look that much like a squirrel (outside the tail), but these are minor things to consider. 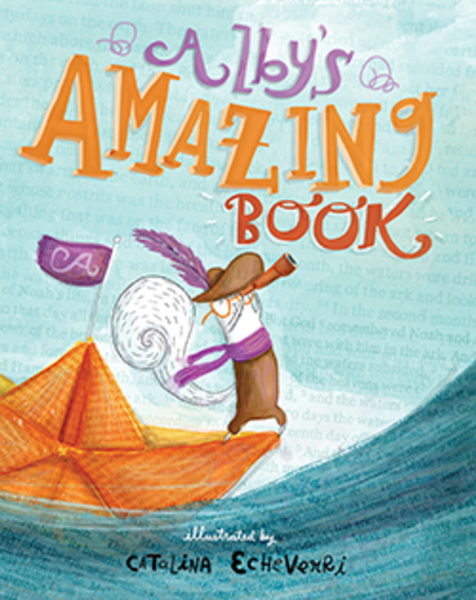 If you’re looking for a cute picture book that helps point your children to the Author behind the stories of their Bible, then Alby’s Amazing Book, is a good introduction. I mentioned the following story in my sermon yesterday but couldn’t remember the details of it. There’s debate on whether this really happened, but regardless, it’s a beautiful picture of an inclusive worship as typified in our study of Acts 10 yesterday. One last dramatic scene awaited the rebirth of the Republic. Back in Richmond, soon after the war was over, the congregation of St. Paul’s met again for the usual Sunday services, which were to be the Episcopalian Order of Holy Communion. The Richmond gentry and the former leaders of the Confederacy were present as usual in spite of the destruction of much of the city. When it came time for the faithful to kneel before the altar and take the Eucharistic bread and wine, a joyful young black man strode forth and knelt at the altar rail alongside the white congregants. A silence and a gasp went across the segregated congregation. This had never happened before, and the clergy were frozen in their places not sure what to do. A black man kneeling beside a white man? It was unknown in the old South. From the back of St. Paul’s a lone figure in a gray suit walked forward and knelt beside the freed slave. With a look of command he nodded to the priests, who gave both him and the black man Holy Communion together, eating bread from the same paten and drinking wine from the same cup. The lone figure was Robert E. Lee, who knelt beside the man whose slavery, among other things, he had only recently fought to defend. And when the vanquished Southern commander came to the altar, the rest of the congregation followed him as well, white and black together. There are a lot of Christmas books out there for children. Some of them good, some of them barely tolerable. I found Alison Mitchell’s The Christmas Promise, to be a helpful overview of the Christmas story which emphasizes an important concept often left out of Christmas stores: that Christ is King. It seems that overall, most of the world has this idea that Christ is still a little baby, and that they fail to realize that Christ’s coming to earth as a child was for the purpose to fulfill the promises of God to provide a king who would lead and redeem His people. In that, The Christmas Promise succeeds. The illustrations are interesting and clear, although perhaps a bit frenetic at points. Otherwise, they do helpfully add to the story rather than detract from it. If you are looking for a helpful children’s book to tell you one of the most neglected “whys” of the incarnation, then let me recommend The Christmas Promise wholeheartedly. Today, for all you who do not know, is Guy Fawkes Day! On November 5, 1605, a plot was foiled to blow up the Houses of Parliament by a number of Catholic conspirators including Guy Fawkes. Hardly remembered anymore outside of the United Kingdom, it should be the ever present reminder to Christians for God’s providential preservation of order in a world that craves chaos. You are currently browsing the Working out Salvation with Fear and Trembling blog archives for November, 2014.